The MAX9491 multipurpose Clock Generator is ideal for Communication applications. It offers a factory-programmable PLL output that CAN be set to almost any frequency, ranging from 4MHz to 200MHz. The MAX9491 uses a one-time-programmable (OTP) ROM to program the PLL output. The MAX9491 also features an integrated voltage-controlled crystal Oscillator (VCXO) that is tuned by a DC voltage. The VCXO output is used as the PLL input. The VCXO has a wide 200ppm (typ) tuning range. The OTP on the MAX9491 is factory preset, based upon the customer request. Contact the factory for samples with preferred frequencies. The device operates from a 3.3V supply and is specified over the -40C to +85C extended temperature range. The MAX9491 is available in 14-pin TSSOP and 20-pin TQFN (5mm x 5mm) packages. This is one package pinout of MAX9491,If you need more pinouts please download MAX9491's pdf datasheet. 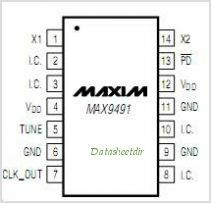 This is one application circuit of MAX9491,If you need more circuits,please download MAX9491's pdf datasheet.